A Pitkiny Story Is Icumen In! 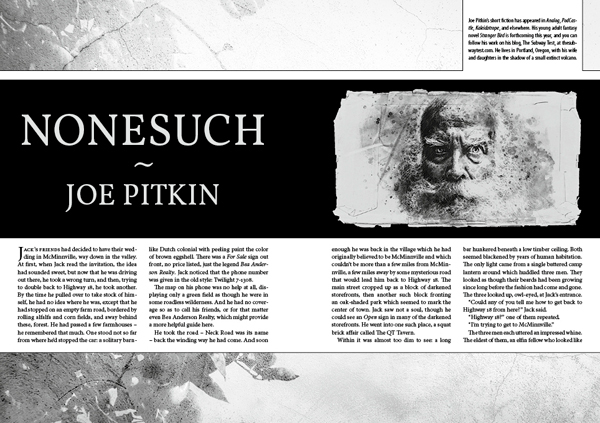 After a bit of a dry spell, I’m happy to announce a new Pitkin publication: my story “Nonesuch” has been accepted for an upcoming issue of Black Static, the great English horror and dark fantasy magazine. I’m especially excited to have this story find such an excellent home. “Nonesuch” was a huge leap for me as a writer, my first attempt at dark fantasy, and definitely one of the best stories I’ve ever written. Watch for “Nonesuch” in Black Static (as well as my new John Demetrius story “Proteus” in Analog) in the coming months!